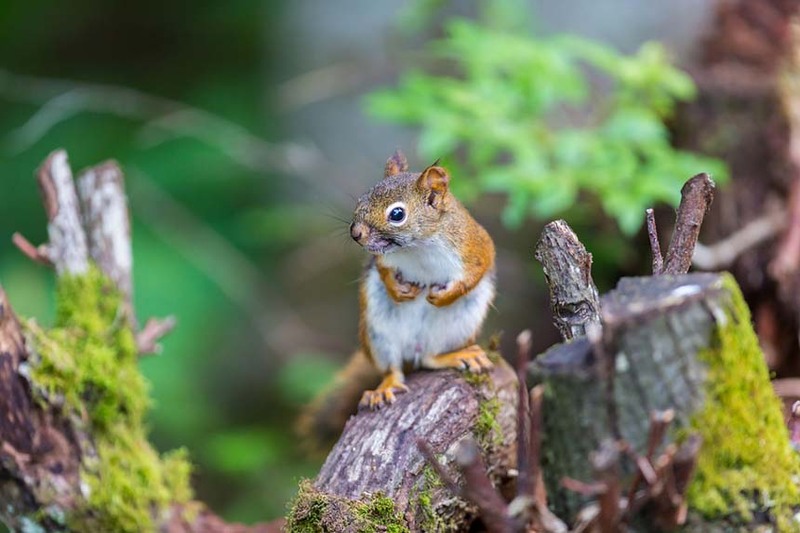 » What is The Squirrel Breeding Season? Squirrels are abundant throughout the world. This is only natural considering how there are hundreds of different squirrel species. Even though they all belong in the same, broader genus Sciurus, and their general behavior is relatively similar their gestation and mating habits differ somewhat. For the purposes of this article, we will review the breeding seasons for the fox, flying, red and ground squirrels. Afterwards, we will dive a bit deeper for the eastern gray squirrel species, who is the most common type of squirrel one can encounter in North America, its native region. Let us take a quick peek at the breeding habits and seasons of the aforementioned squirrel species. Ground Squirrels: Unlike most other squirrel species, ground squirrels mate only once a year. After their winter hibernation ends, they commence their mating season which lasts merely a few weeks. Neither ground squirrel gender is monogamous – both males and females mate with multiple partners. A ground squirrel gestation period lasts roughly a month. A single litter of babies can be quite large, with an average of seven to eight baby ground squirrels. Unfortunately, not all of them survive to maturity. Red Squirrels: When it comes to red squirrels, breeding seasons last approximately a hundred days. During that period, a red squirrel female is only fertile for a single day. Thus, mating must happen really quickly. It is common for the dominant male red squirrel to copulate with his mate repeatedly, so that breeding success is guaranteed. A female red squirrels gestation period lasts a bit more than a month. Typically, they produce two litters of babies per year, therefore, they have two two breeding seasons per year on average. Let’s move forward to reviewing the breeding habits and seasons of the fox & flying squirrels. Fox Squirrels: Interestingly, fox squirrels do not seem to have a fixed breeding season. Males and females of the fox squirrel species seem to breed year round, with males constantly having to compete with each other in order to copulate successfully with their females of choice. A female fox squirrels gestation period lasts around 45 days, typically, and they seem to give birth to a lesser number of babies per litter – two to three baby squirrels on average. Flying Squirrels: When it comes to flying squirrels, unfortunately, there has not been enough research to determine their exact mating habits and seasons. What we do know is that mating happens twice per year, once in early spring and once in late summer. A flying squirrels gestation period is estimated to be around 40 days. On average, a female flying squirrel gives birth to three babies per litter. In the case of the eastern gray squirrel, there seems to be an age component when it comes to their breeding seasons. An eastern gray squirrel typically begins breeding after they hit the one year old mark. Young and inexperienced female eastern gray squirrels seem to mate and breed only once per year. On the flip side, after they come of age and mature enough, their breeding seasons increase to two on a yearly basis. These two breeding seasons take place in winter and summer respectively. The first, winter breeding seasons starts on January and finishes on February, whereas the latter, summer breeding season is nearly twice as long. It first starts around May and keeps going until July. In most cases, three to four hairless squirrel babies are born per season, after a forty five day gestation period. The most simple answer to this question is that well, baby squirrels take a while to grow up enough in order show themselves. Therefore, if an eastern squirrel female mated in July and gave birth in August, the squirrel babies would start making their appearance around October. And even after the squirrel babies start getting around, it takes quite a while for them to really start go out on their own, away from their family. When they finally do,they usually stay within around two miles of their place of birth. In order to better understand squirrels, we need to say a few words on their mate finding strategy. Well, the squirrel mating reality is anything but romantic. It is a process that involves savage competition, as well as utilitarian, feeling-less copulation. When the females first become fertile, they start producing sounds and scents attracting all the male squirrels available around. These males start fighting each other in order to prove their dominance and strength. After a victor has been decided, on in some cases, while the fight is still raging, the female squirrel starts running away. The point is to make the males chase her, in order to prove their suitability as mates further. After a male eventually catches the female, they mate. Afterwards, other male squirrels may mate with the female as well or, in some cases, the first, dominant male prevents any other overeager suitors by standing guard around the female, until she is no longer fertile. Squirrels are quite the interesting little devils. For all their different species, who number in the hundreds, they are more alike than different in behavior and appearance. When it comes to their breeding seasons, each sub species has its own quirks. Ground squirrels have a single breeding season, whereas fox squirrels seem to breed year around, for example. When it comes to the eastern gray squirrel, the most commonly encountered species, we can identify two different breeding seasons. The first takes place in winter, whereas the second in summer. The winter breeding season lasts for about a month, from January to February. The summer breeding season starts on May until July, lasting a whole month longer than the winter breeding season.